Chopin, Fr�d�ric Fran�ois (1810-1849), Polish composer and pianist of the Romantic school, regarded by some as one of the greatest composers of piano music. Born March 4, 1810, in Zelazowa Wola, near Warsaw, of a French father and a Polish mother, Chopin began to study the piano at the age of four and when eight years old played at a private concert in Warsaw. Later he studied harmony and counterpoint at the Warsaw Conservatory. He was precocious also as a composer; his first published composition is dated 1817. He gave his first concerts as a piano virtuoso in 1829 in Vienna, where he lived for the next two years. After 1831, except for brief absences, he lived in Paris, where he became noted as a pianist, teacher, and composer. He formed an intimate relationship in 1837 with the French writer George Sand. In 1838 Chopin began to suffer from tuberculosis and she nursed him in Majorca in the Balearic Islands and in France until continued differences between the two resulted in an estrangement in 1847. Thereafter his musical activity was limited to giving several concerts in 1848 in France, Scotland, and England. He died in Paris on October 17, 1849, of tuberculosis. 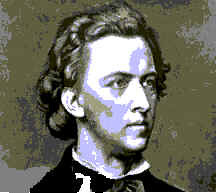 Nearly all of Chopin's compositions are for piano. Although an expatriate, he was deeply loyal to his war-torn homeland; his mazurkas reflect the rhythms and melodic traits of Polish folk music, and his polonaises are marked by a heroic spirit. The influence of Italian opera composer Vincenzo Bellini can also be heard in his melodies. His ballades, scherzos, and �tudes (studies, each testing a particular aspect of piano technique) exemplify his large-scale works for solo piano. His music, romantic and lyrical in nature, is characterised by exquisite melody of great originality, refinedoften adventurousharmony, subtle rhythm, and poetic beauty. Chopin greatly influenced other composers, notably the Hungarian pianist and composer Franz Liszt, and the French composer Claude Debussy. Chopin's many published compositions include 55 mazurkas, 27 �tudes, 24 preludes, 19 nocturnes, 13 polonaises, and 3 piano sonatas. Among his other works are the early Concertos in E minor and in F minor, both for piano and orchestra and showing the strong influence in form and melody of the piano concertos of Johann Nepomuk Hummel, a cello sonata, and 17 songs.